Chiropractic adjustments attempt to increase the movement of the joint complex. With injury, poor posture, sprains, and strains, muscles tighten up and the joints can become locked up. This lack of movement is felt when you can not look over your shoulder without feeling pulling, dull pain, or a twinge of pain. Mildly stuck joints can be loosened up in the day with stretching and range of motion exercises. Moderately stuck joints often need a little help to restore their normal motion with chiropractic adjustments. Severely stuck joints cause a person pain whenever they put pressure upon the joint or try and move the joint complex. People feel a stuck join at home and during the daily movements. They can place their finger where the pain originates with any movement. They say if I sit or stand for too long the pain always starts my low back right here, as they point to a facet joint. During the exam they can clearly see that they do not have the range of motion equivalent on each side. In addition, pressure on the joint complex causes pain because the joints are not moving as they should. Good and healthy joints do not experience pain with orthopedic testing. Pressure upon that joint also causes pain. A healthy joint comfortably moves when light pressure is applied to the spinous process, rocking the joint back-and-forth. A mildly stuck joint feels a little stiff and a little sore to the patient. Whereas moderate and severe joint sprains cause immediate pain when pressure is applied. Below are the four most common ways to increase joint movement in a chiropractic office. These treatments can also complement other physical therapy treatments and modalities to decrease muscle spasms and increase joint motion. Activator Technique utilizes a spring-loaded device to tap or nudge the joint. Most patients describe the activator as the clicker or popper because of the sensation they feel. Many hear the clicking sound and think of it as a staple gun sound with a nudging pressure felt on their joints. At the end of the spring-loaded device is a rubber end that delivers a force from the spring into the joint. We've all heard the equation force equals mass times acceleration. Well, the spring-loaded device is a very small mass but hikes acceleration rate to put enough force into the joint to get it moving before the muscles can tighten up and resist joint movement. It feels like a nudge on the joints. The amount of force delivered by the activator can be adjusted, where more pressure is used on the low back than the neck. There are several variations of the Activator including Torque Release & ProAdjuster, which utilizes the same principles to nudge the joint before the muscles can tighten up and prevent movement. All of the treatments are very effective at increasing joint motion. For the patient, the advantage is the low force technique that delivers the benefit they are seeking. Activator is a great treatment for anybody in severe pain with very limited joint mobility. This is one of the techniques we use more commonly as patients increase in age and have more arthritis. 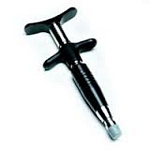 It is also very safe to use on any patient with surgical fusions across the joints. Thompson drop technique utilizes specific tables that drop or give way. the table drops to provide a mechanical advantage to push one joint past another. people do not feel any pain or discomfort with this procedure. they often describe hearing only a banging of the table. people who are nervous about having their neck popped or cracked often prefer this type of treatment. likewise, it is very effective for severe neck sprains and strains that cannot be turned or rotated. thompson drop technique is also safe and effective on cervical discs and arthritic joints. it does not provide any rotation to the joints and keeps them in a neutral position throughout the adjustment. Through the years some patients have expressed concern about feeling twisted and torqued during the manual manipulation. They felt a real benefit from the procedure, but were nervous about having it done to them. These patients tend to prefer Thompson Drop Technique instead of the manual manipulation. They feel more comfortable laying in a neutral position without any twisting or torquing motions. They can feel the bang of the table but do not feel the adjustment or hear the popping like they can with manual manipulation. Some patients prefer to have manual manipulation performed on their low back and upper back, and then Thompson Drop Technique used on their neck when they have difficulty relaxing during manual manipulation. They inherently know that a chiropractic main manipulation on the neck is very safe and effective, but they have a hard time relaxing to let the chiropractor perform the adjustment. Thompson Drop Technique allows them to relax because they know there won't be any twisting or torquing. Some people prefer to have Thompson drop used on their neck, upper back, and low back for their chiropractic adjustments. To the joint complex, Thompson Drop Technique is pushing one side of a joint past the other. It's creating separation and opening the joint within its normal range of motion. In the office I like to describe it as a quick kick to a rusty door hinge. A small kick provides enough force to pop that joint open before the gate can feel any pressure applied to it. Whereas manual manipulation is more like using your shoulder to rock the joint open, which requires more force and pressure. Activator technique is like several very small and fast kicks to break the rest in the door hinge. Either way the joint is moving, and the difference becomes patient preference only. 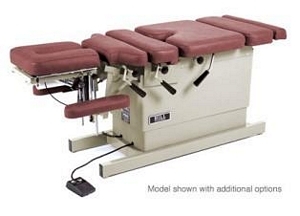 Flexion distraction therapy utilizes a table that bends and rotates to stretch the low back. With flexion distraction we’re using the weight of your legs to help stretch the low back and relieve stress across it and lumbar facet joints. The table can be moved either up and down or with a comfortable rotation. People describe a light stretch across the low back. Throughout the treatment they notice increased, pain-free range of motion and flexibility developed with each rocking movement. To the facet joints and discs in the low back, we’re using a longitudinal stretching force to decompress the spine. The bending motion of the table further rocks the joints in flexion, extension, and lateral flexion. As a patient progresses, small rotational movements are included in the treatment to further open up and relieve compression across the low back joints. This is a great treatment for anybody experiencing severe low back pain. The decompression stretching releases the pressure across the pain sensors. The light and comfortable movement sends signals to the brain to say "hey I'm okay", and the brain signals back to low back muscles allowing them to relax. Throughout the course of the treatment more relaxing signals are sent to the low back muscles, allowing the joints to have increased range of motion. This is a great treatment for anybody with osteoarthritis or degenerative changes in their low back. It is also a very effective treatment for lumbar disc bulges, herniations, and extrusions. The treatment effectively opens up the joint complex without straining the joint or producing painful rotational stress across it. Going back to the stuck rusty door hinge. This would be like slowly rocking the rusty door hinge with a small amplitude until a little rust breaks. With the increased movement we rock the joint a little bit further and further until full-motion is restored in the hinge. The treatment is performed with pain-free range of motion. Flexion distraction therapy can also be combined with Thompson Drop Technique or manual manipulation to increase the joint motion in the low back. Flexion distraction therapy was the beginning of spinal decompression therapy that is seen advertised on the news for treating low back pain and disk herniations. Chiropractic and manual manipulation is a very safe and effective procedure for neck aches and pains. Millions of adjustments are performed every day without incident. In fact, numerous studies have shown the effectiveness and safety of chiropractic treatments. numerous healthcare studies have shown that manipulation provided early in treatment is the most cost effective therapy for neck and back pain. Graston Technique utilizes stainless steel instruments to break up adhesions or scar tissue in muscle. Muscles and tendons can develop soft tissue fibrosis or chronic inflammation with activity, repetitive stress, over use, or acute trauma. Utilizing the Graston tools helps speed healing and recovery faster than stretching, massage, exercise, physical therapy, or chiropractic alone. Chiropractors, Physical Therapists, Hand Therapists, Occupational Therapists, and Athletic Trainers have utilized Graston Technique to treat athletes for years. It can also be used on every day injuries associated with posture, headaches, neck pain, back pain, shoulder pain, rotator cuff syndrome, tennis elbow, golfers elbow, trigger finger, knee pain, IT Band syndrome, shin splints, or plantar fasciitis. Chiropractic increases joint movement and range of motion. Physical therapy exercises and stretches enhance chiropractic adjustments by decreasing muscle spasms and increasing range of motion and flexibility. Specific stretches can be performed in the neck and the low back, along with strengthening exercises. Combining chiropractic adjustments with physical therapy enhances recovery and reduces the risk of future sprains and strains. There are multiple ways to adjust a stuck joint. Activator Technique, Thompson Drop Technique, flexion distraction, menu manipulation, and decompression therapy are all effective ways at increasing joint motion and restoring normal movements. Chiropractic manipulation will shorten the overall recovery time and decrease your pain much faster than with physical therapy or medication alone.